Good price for a 1GB data sim, works out at £11.52 for 3GB which is cheaper than most 3GB sims for sale on Amazon and Ebay. Data valid for 30 days from first use. Not sure if this is a micro sim or normal size. Very good price - especially as there's free delivery on this too. These are really good value. Orderd 3 great deal !! Anyone know if this will work in a vodafone dongle? Thanks for that ashy, can these dongles be unlocked? its easy to unlock the dongles as they say the softwares out there for free. do a search for huawei unlocker if its a new un then you also need huawei modem code writer as well. Will these work with the new iPad ?? Yes they will, but you will have to cut them down to size using a cutter which you can buy on Amazon for £3.59. I do this all the time with iPad 2. Yes they will, but you will have to cut them down to size using a cutter … Yes they will, but you will have to cut them down to size using a cutter which you can buy on Amazon for £3.59. I do this all the time with iPad 2. Or just use normal scissors to cut it down to size of the sim bracket. The title says "original" sim. But the Technical details say: 1 x 3G Micro-SIM. Manufacturer's DescriptionYour iPad on Three - Pre-loaded with 1GB and … Manufacturer's DescriptionYour iPad on Three - Pre-loaded with 1GB and valid up to 30 days. 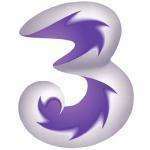 Get a 3G Micro-SIM from Three and connect your iPad to.. Tempted to order a stack, is there an 'expiration date' so to speak? I got a Three mobile broadband SIM today - £15 rolling contract for 10GB monthly. It came as a microSIM but the chaps in the Three store gave me an adapter, so works a treat in my miFi unit. So far really pleased - found 3g signal excellent. I'm not sure whether this comes as a micro or not, but if it doesn't come in the format needed I'd be cheeky and go into a store and ask for an adapter/ or get it cut. Yes be careful, I have bought one before thinking it was for a dongle and it was in fact the cut down "micro" one. Fine if you have an ipad though or if you can find an adaptor to "big it up" for a dongle. Yes they do, depends on how old the stock is. For three it is 2 years from when they distribute the sim. I have just received two today ( i used the seller total digital stores on amazon - if you click on the " 22 new from 0.01p" it brings a list of other sellers up ). The ones they send are full size sim cards ( in proper sealed retail packs). hey. does anyone know if the sim will work in a three network huawei mifi. not a dongle. sounds like it'll be a microsim, at least according to the item description. Want this as it's good deal but dongle modems to put the SIM into seem quite expensive. Anyone got recommendation for cheap dongles? I bought one of these yesterday. This isn't really a hot deal as such since they are always around this price on Amazon. Want this as it's good deal but dongle modems to put the SIM into seem … Want this as it's good deal but dongle modems to put the SIM into seem quite expensive. Anyone got recommendation for cheap dongles? CEX sell used ones for around £10-12 and many of the older ones were provided unlocked as standard. I bought mine from eBay for £9 delivered. It's O2 branded but accepted a 3 sim without needing an unlock code and works fine. does anyone know if you can put a data sim into an old android mobile & use the mobile as a wi-fi hotspot? Sort of a cheapo mi-fi. Amazing timing - I just talked myself into upgrading to an Ipad 4G since the 64gb WiFi was still not in stock and I was getting so fed up they gave me £40 of the price difference. Ordered 2.. might order more though it probably wont be needed until the winter when I am back on the bus every day. 6 on the way! Thanks OP! Yes, you can. Best to keep it on charge while doing so though as it usually drains the battery pretty quickly. Got the one that I ordered today. It is a standard sized SIM like the other two I had ordered from another Amazon trader last week but this seller (foneshop) had crushed the shat out of the package to get it to fit in as small a jiffy bag as possible, thus also breaking the seal on it at the same time. The SIM card looks fine though and that's the main thing I suppose. Good find, have some heat. Yes, you can. Best to keep it on charge while doing so though as it … Yes, you can. Best to keep it on charge while doing so though as it usually drains the battery pretty quickly. Thanks for the info, ordered a couple.